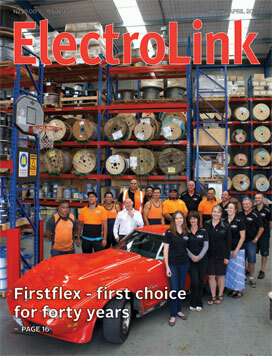 With over 1,400,000 metres of cable across more than 80 product series, flexible cable supplier Firstflex has today more cable ‘on hand’ to support the immediate demands of industry. And when industry calls for a non-standard solution, the Firstflex team itself is ‘on hand’ to procure the right cable from its suppliers throughout the world. It was this level of commitment Dean Lipscombe encountered when he sought a replacement for a damaged 11 kV trailing cable feeding a 400 tonne bucket-wheel excavator at Bluescope Steel’s Waikato north-head, open-cast, iron-sand mine. With massive changes to the regulations in 2010 and refinements to these changes occurring in three annual amendments since then, the industry has had to run to keep up. For those that haven’t bothered keeping up, any upcoming review of the licensing regime could look very closely at the monopoly given to electricians and inspectors over certain electrical work and conclude that the failure of registered people to adopt changes in the safety verification and compliance regime and embrace certification was sufficient reason to scrap the licensing system and its exclusive access to prescribed electrical work. That is because the means by which electricians and inspectors are entrusted to ensure public safety now centres on the carrying out of testing and checking, and the visibility given to it via three separate certification or documentation checkpoints on the way to livening: certificates of compliance (CoC), records of inspection (RoI) and electrical safety certificates (ESC) – each tied to a level of risk. Residential and commercial demand for on-grid solar power installations has increased four-fold in the last financial year and solar industry projections are for continued exponential growth, mirroring the Australian solar experience. The rapid uptake of solar generation across both the residential and commercial sectors is being price led as international over-supply of photovoltaic (PV) solar panels continues to drive installed costs down, delivering faster payback and a greater return on investment. In tandem with this, Electricity Authority reforms to remove roadblocks and speed up the on-grid connection process to allow solar generation to be exported to the national grid is creating greater certainty for PV installers and end-users. International machine safety standards are changing rapidly and changing with them could lower overall safety and compliance costs while increasing productivity through reduced safety-related stoppages and factory downtime. A traditional machine safety approach often takes a separate hardwired, ‘bolted-on’, machine safety structure but these solutions might often be viewed by machine operators as an impediment to productivity and, possibly, something to circumvent to meet production targets. However, when machine safety is dealt with up front with safety functionality integrated into machinery and process design, it can more effectively address safety compliance issues. 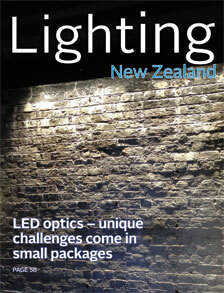 When a luminaire designer proposes a new light fitting they need to solve a number of light control challenges. The principal challenge is to direct the light coming from the light source to where it’s needed without sacrificing efficiency and appearance. There’s always a trade-off between efficiency, appearance and visual comfort and cost.